The emerald-green Königssee near Berchtesgaden is surrounded by steep walls of rock, with the 1800-metre east wall of the Watzmann towering above its west shore. 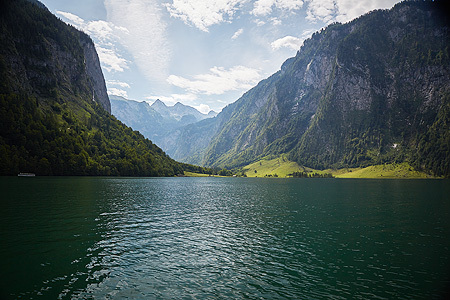 Around eight kilometres long and over a kilometre across at its widest point, and with a depth of up to 190 metres, the lake occupies the whole valley between the Watzmann in the west and the Jenner and Gotzenberg in the east. This jewel of the Bavarian Alps is a haven of peace. In 1978, to preserve the beauty of this region of lakes and mountains, the Bavarian government founded the Berchtesgaden National Park, which centres around the Königssee. Surrounded by high mountain walls at the end of the valley is the Obersee, connected from the Königssee by a brook. St Bartholomew's Church in front of the east wall of the Watzmann, is a cultural highlight in this unspoilt countryside. The Königssee is located in the southeastern part of Bavaria, south of the market town of Berchtesgaden. Boats run all year round, unless the lake freezes over in winter.